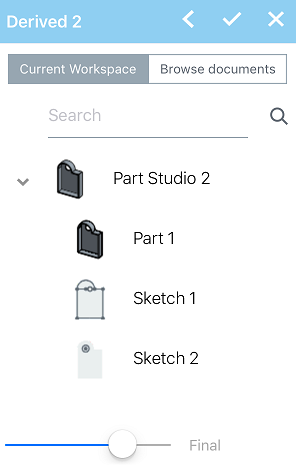 Insert parts, sketches, surfaces, helices, planes, or Mate connectors from one Part Studio into another in the same or a different document (thereby linking the documents), with an associative link. You also have the ability to insert these entities into a Part Studio from a different version of the same document. While in a Part Studio, click . A list of Part Studios in this document and their features appears. If the list is lengthy, use the Search box to search for a Part Studio or feature by name. You are able to select Current document and derive from a different version or you may select Other documents and select from their features and parts. You are able to select from other documents only if that document has one or more versions. A notice is displayed regarding the state of the document: if no version exists or if a newer version exists. See Linking Documents for more information. Use the filters and search bar to find and select a document. Select one or many features of that document. You have the ability to insert a derived feature from only one parent Part Studio at a time. Open the Derived dialog again to select from an additional Part Studio. You are not able to select a derived feature for insertion more than once in the same operation. You are, however, able to reopen the Derived dialog and insert the same derived feature an additional time. For example, if you want two of the same part in the target Part Studio, you must select the part once, close the Derived dialog, then reopen the dialog and select the part a second time. In the target Part Studio, simply double-click the Derived feature to open the Derived dialog. Select a new document if necessary, or Part Studio and then the feature to insert. Click the checkmark to accept your selections and close the dialog. Note that subsequent features may fail - check your Part Studio and make any necessary adjustments. After selecting a sketch you can use that sketch to perform an extrude in the target Part Studio. In the parent Part Studio, when you make a change to the sketch, such as a dimension, the change is reflected in the target Part Studio. You are able to use the sketch in many Part Studios as a derived feature. Then in each Part Studio, continue with varied designs. Derived features have a one-way correspondence: from the parent Part Studio to the target Part Studio. When you change the feature in the parent Part Studio, the change is reflected in the target Part Studio, but not vice versa. This feature does not accept circular references. For example, when inserting a feature from Part Studio A to Part Studio B, you cannot insert any feature from Part Studio B to Part Studio A. The operation will fail due to the circular reference attempted from Part Studio A to B to A again. The visibility setting of a part is irrelevant when inserting a derived part - derived parts are always visible when they are inserted, regardless of what their setting is in the original Part Studio (workspace or version). While in a Part Studio, select the Derived tool. A list of Part Studios and their features appears. 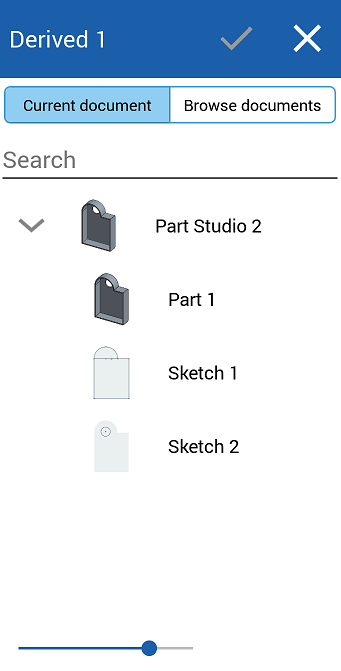 If the list is lengthy, use the search box to search for a Part Studio or feature by name. Tap to select from the list. Optionally, select Browse documents to view Part Studios of other documents. Use the filters to find and select a document, and then select one or many features of that document. You have the ability to select from other documents only if that document has one or more versions. A notice is displayed regarding the state of the document if no version exists or if a newer version exists. If no version exists, tap to create a version in that document. If you derived a part, it is listed in the Parts list (under the Features list) where you can toggle the eye icon to hide/show that part. If you derived a sketch, you are able to toggle the eye icon next to the derived feature (in the Features list) to hide/show that sketch. If you have derived a part (or sketch) from another document, a linked icon appears next to the Derived feature in the Feature list to indicate that it is linked to another document. When a newer version of the document from which you derived the part is created, the link icon in the Feature list highlights in blue, and an identical icon appears on the Part Studio tab. See Linking Documents for more information on linked documents and how to update them. You are unable to select a derived feature for insertion more than once in the same operation. You are able to reopen the Derived dialog and insert the same derived feature an additional time. For example, if you want two of the same part in the target Part Studio, you must select the part once, close the Derived dialog, then reopen the dialog and select the part a second time. This feature does not accept circular references. For example, you are unable to insert a feature from Part Studio A to Part Studio B and then to Part Studio A again, the operation will fail. The visibility setting of a part is irrelevant when inserting a derived part - derived parts are always visible when they are inserted, regardless of what their setting is in the original Part Studio(workspace or version). If you derived a part, it is listed in the Parts list (under the Features list) where you are able to toggle the eye icon to hide/show that part. If you derived a sketch, you have the ability to toggle the eye icon next to the derived feature (in the Features list) to hide/show that sketch. This feature does not accept circular references. For example, you are not able to insert a feature from Part Studio A to Part Studio B and then to Part Studio A again, the operation will fail.